"This is a very tasty Christmas dessert. This recipe is very nice for Christmas parties as it makes 2 1/2 dozen 2 1/2 inch cookies." Preheat the oven to 350 degrees F (175 degrees C). Lightly grease one cookie sheet. Sift together the flour, baking soda, salt, allspice, ginger, cloves and cinnamon. Add to sugar mixture and mix well. Cover and refrigerate for 2 hours. Roll dough 1/4 inch thick on floured board. Cut with floured gingerbread cutter. Place about 2 inches apart on cookie sheet. Bake for 10-12 minutes. Cool and decorate with frosting. 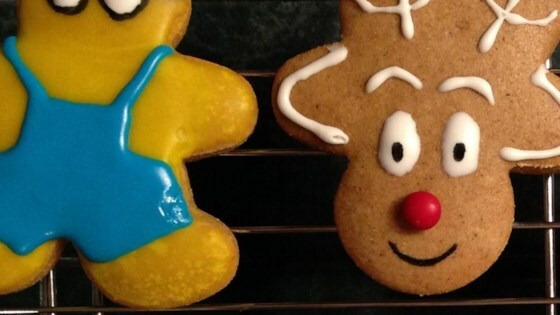 See how to make simple, 5-star gingerbread cookies. I subsituted butter for the shortening and took them out of the oven a little early (I like very soft cookies) and they were perfect! Followed this recipie to the letter and my husband says they are the most incredible gingerbread cookies he's ever had.